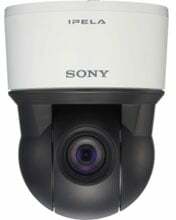 The Sony-Electronics SNC-EP520 is a High-Quality PTZ Camera with 36x optical zoom. The SNC-EP520 camera supports three compression formats: JPEG is the best choice for high-quality still images, MPEG-4 provides clear video images over limited-bandwidth networks, and H.264 is the alternative for severely limited-bandwidth networks, with twice the efficiency of MPEG-4. Sony"s DEPA (Distributed Enhanced Processing Architecture) technology allows the SNC-EP520 to send not only images but also related metadata, including object size and position, to the DEPA-enabled recorder. Unlike conventional analytic systems, where all of the image processing is performed by the recorder, DEPA thereby avoids CPU overload.